I've purchased a few Para 1911 SS Super Hawgs - I like them and mine work fine - I've been unsuccessful so far in purchasing a Springfield 1911 Longslide stainless - thanks in advance for your thoughts on the Springfield SS Longslides (.45 ACP) versus the Para SS Super Hawgs (.45 ACP) - I'm posting this on the Springfield board, too. This is my Springfield Long Slide I picked up about 5 years ago. It's a fantastic pistol. Never a hiccup with any ammo. The lower picture is it with my Springfield Range Officer. Beautiful pistol - damm, they are hard to find for sale !! Yes, they are. Springfield tools up to make a very limited run of them every year. I've only seen one other one for sale since I bought mine. And the dealer who had it said it sold in hours. "Springfield tools up to make a very limited run of them every year." - I wish ! I called the Springfield Custom Shop after reading your post and, alas, they are no longer produced, per the friendly gal in the SCS. Sorry, I did not know that. I wonder why? They certainly seem to have a demand for them. I asked the gal about that - no real solid answer about why they don't produce them any more. It is probably a supply and demand thing. By limiting the supply they are keeping an artificially high demand for them. Limited supply also allows them to charge a higher price and make more profit. Just my $.02 worth. I wonder if they will come back as SA recently introduced the 10mm in 6 inch. Also the old Para LE Hunter in 6 inch and 10mm seems to have made it into a Remington product. Another 6 inch is the Bruin made by DW but then one is up around $2K. 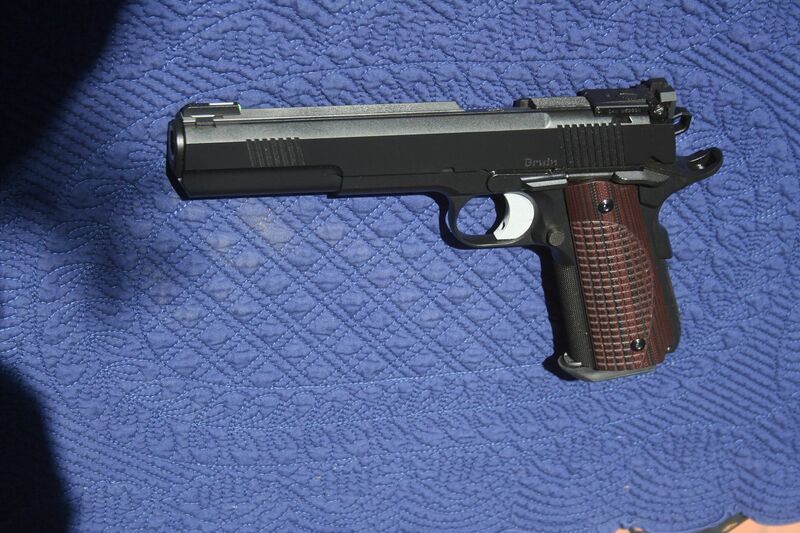 Still I bought one in 10mm and it is a lovely pistol. I would think one in 45ACP would also be nice. I had looked for a SA 10 mm longslide last year but purchased a DW Bruin when I couldn't locate the Springfield. It was my first longslide as well as first 10 mm pistol. It has been a pleasure to shoot. I'd like to find one in 45 acp.